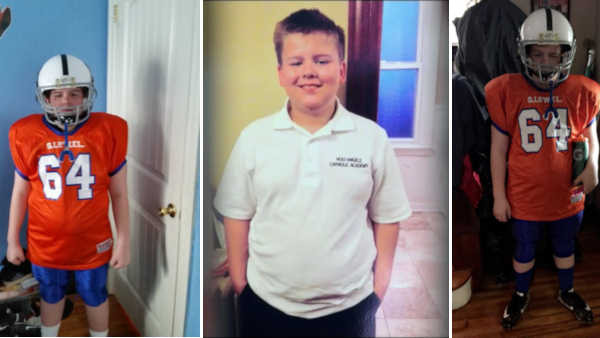 BAY RIDGE, Brooklyn (WABC) -- A grieving family of a teenage boy who committed suicide is now suing the teen's school in Brooklyn, claiming officials ignored months of bullying. The family of 13-year-old Daniel Fitzpatrick filed suit against the Holy Angels Catholic Academy in Bay Ridge, its principal and the diocese. Fitzpatrick hanged himself inside his family's home on Staten Island in August. His parents say the school failed to enforce anti-bullying regulations and ignored their son's abuse. "No child should be exempt from being protected in any law," said Daniel's mother Maureen Fitzpatrick. "I want to see legislation for this country. My son Danny suffered and now we're suffering because he chose to end his life from bullying." School officials are not commenting on the lawsuit, which claims Daniel was the target of bullying for months by students and teachers. Police later discovered a note after the suicide where Daniel had written three haunting words: 'I give up'.